The creative geniuses at northStudio360 produce the industry’s best virtual tours, aerial tours and HD production. They are an experienced, passionate team that consistently delivers cost-effective, high quality tours for every client. Unlike many virtual tours, which offer a poor quality, 180 degree view, northStudio360’s tours give the viewer a realistic experience, with 360 degree panoramic views as they walk from room to room at their own pace.. They can view individual products from all angles and control their movements independently. The creative geniuses at northStudio360 produce the industry’s best virtual tours, aerial tours and HD production. They are an experienced, passionate team that consistently delivers cost-effective, high quality tours for every client. Unlike many virtual tours, which offer a poor quality, 180 degree view, northStudio360’s tours give the viewer a realistic experience, with 360 degree panoramic views as they walk from room to room at their own pace.. They can view individual products from all angles and control their movements independently. 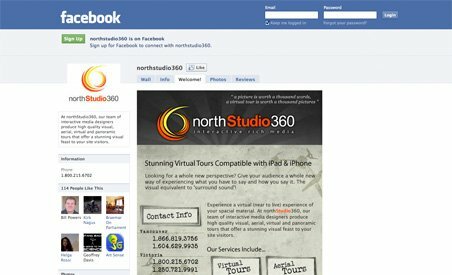 northStudio360’s virtual tours are the progressive, aggressive tools that help businesses increase customer retention and overall sales. With offices in Vancouver, Victoria, Calgary and New Brunswick, northStudio360 can makes your virtual dreams a reality.